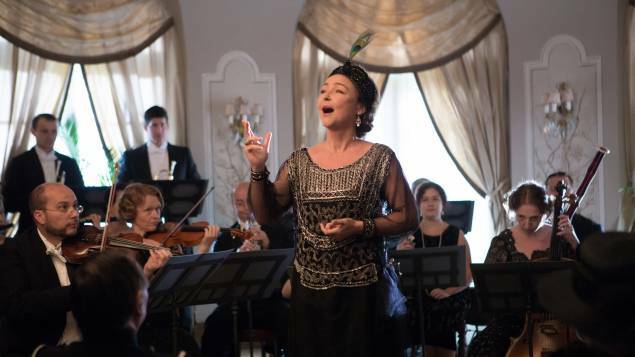 The 2015 French comedy-drama Marguerite stars Catherine Frot as a socialite and aspiring opera singer who believes she has a beautiful voice. Set in and around the castle of Marguerite Dumont outside of Paris in the early 1920s, the film finds annual party-thrower Marguerite singing wholeheartedly—but terribly—for her guests. Marguerite has been living her passion in her own bubble, and the hypocrite audience, always coming in for a good laugh, acts as if she was the diva she believes she is. When a young, provocative journalist decides to write a rave article on her latest performance, Marguerite starts to believe even further in her talent. This gives her the courage she needs to follow her dream. Despite her husband’s (Andre Marcon, Around a Small Mountain) reluctance, and with the help of a has-been divo, she decides to train for her first recital in front of a crowd of complete strangers. Loosely inspired by the life of American socialist Florence Foster Jenkins, the film is directed by Xavier Giannoli. Marguerite received eleven nominations at the 41st Cesar Awards in France, winning for Best Actress, Best Costume Design, Best Sound and Best Production Design.